Derek Smith, a producer of Top Gear at BBC Pebble Mill sadly died in hospital yesterday (17th March 2015). He never properly recovered following a serious stroke, which he suffered over a year ago. 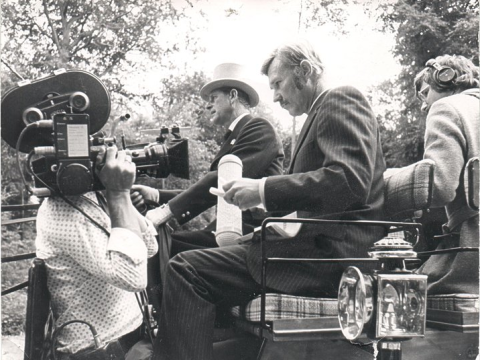 Derek is seen in this photograph, directing on a programme called Four in Hand. It featured carriage driving, and featured the Duke of Edinburgh. The crew includes Jim Knights on camera and Murray Clarke on sound. It was taken around 1974. Thanks to Jim Knights for sharing the photograph.